We are in a world where media is literally at our fingertips 24/7. As I am writing this I am sitting on my couch on my laptop, while the TV is on in the background, and texting my friends from my blackberry. In the words of my mother, “our generation is always ON”. I have always been a multi-tasker and these increases in technology have allowed almost everyone to become a muli-tasker. This look into my media consumption showed me not only the consumption patterns but the vast amount of time that I spend on these sites, devices, shows. Going back to what my mom said, I am “always on” I am always on the computer while checking my phone, or looking online while watching TV, and most of all…doing all three. I’ve caught myself several times doing all three throughout the week. One of the companies I have been looking at in my job search is Carat. Carat is a market-leader in communications specializing in digital media. 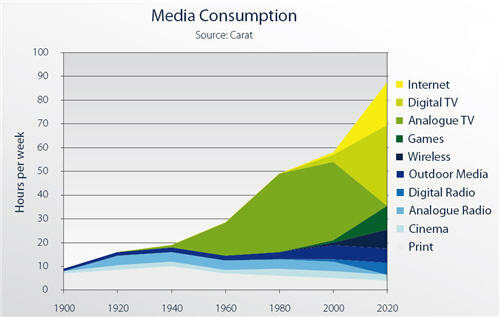 Carat produced the chart above which illustrates media consumption based on the average hours per week further broken down by the medium used. From this observation I also learned about my consumption habits. I always pride myself on not being “girly” I like to watch comedy shows…not Real Housewives of Orange County…or anything on E! for that matter. But looking at my media consumption pattern I saw that all I did was check my mail and look at online shopping sites and I watched THE GIRLIEST shows! I thought this was a very interesting observation!